The Home Stretch Coffee Carrier (TM) and the Home Stretch Carry-Out Food & Beverage Bag (TM) are precision cut expandable baskets made from special reinforced, recyclable plastics. Both carriers can be printed with brilliant color graphics. Both the underlying utility and the plastic are protected by patents. The Coffee Carrier is a 9-inch disc with a center hole that the cup is inserted into. 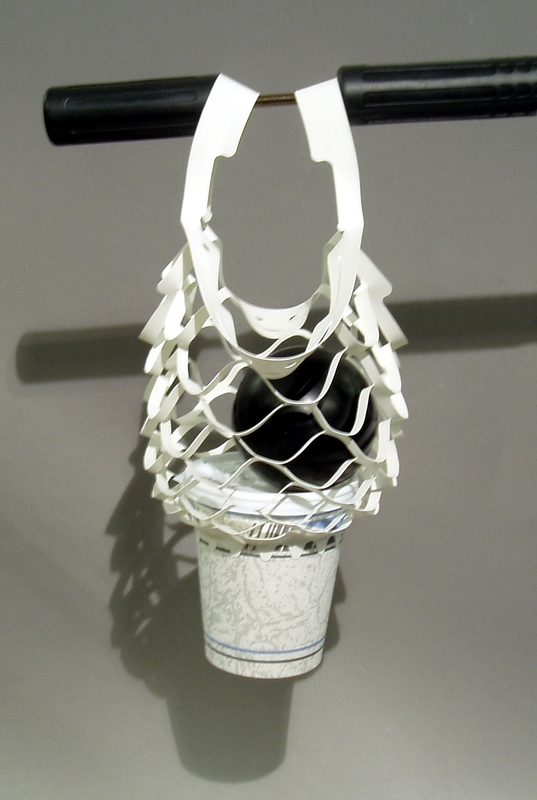 The plastic tabs of the center hole securely hold the rim of the cup. 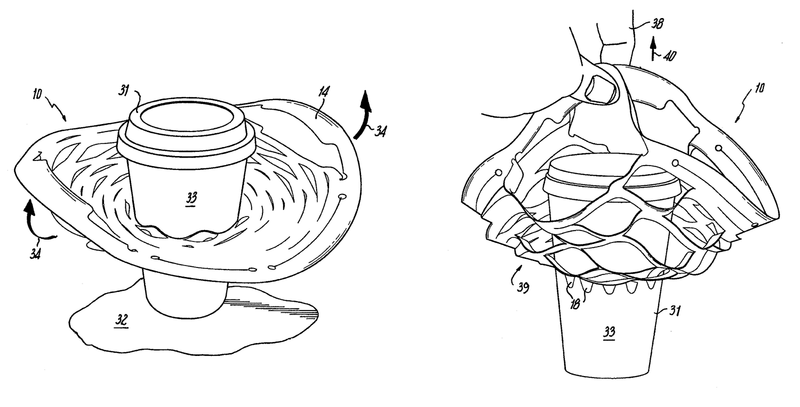 After the cup is secure, lift the side handles and carry it away. Place it on your stroller or bicycle handlebars for a better commute! The Souvenir Picnic Basket is a 17-inch square with special cuts that allow the carrier to stretch around two or four beverages (in cans or paper cups of any size) plus food containers. The genius of the design is the way the carrier cradles the beverage containers so that they don't knock together. The handles interlock and special rip-stop features are built into the die-cuts. Novelty. A flat placemat turns into a picnic basket! A beautiful picture appears and disappears! How awesome is that!?! Utility. It works! Two giant drinks, food containers and more can be carried safely. The handle locks and the drinks are cradled so that they don't spill. Safety. The plastic is FDA approved for food contact and can be printed with soy-based inks. Strength. The product has been tested with heavy Super Big Gulp drinks. The substrate prints like paper but has the strength and tear-resistence of plastic. Collectibility. With its large image area and beautiful print quality, customers will want more than one. "Green." The plastic is recyclable, washable, and conforms with FDA and CONEG.